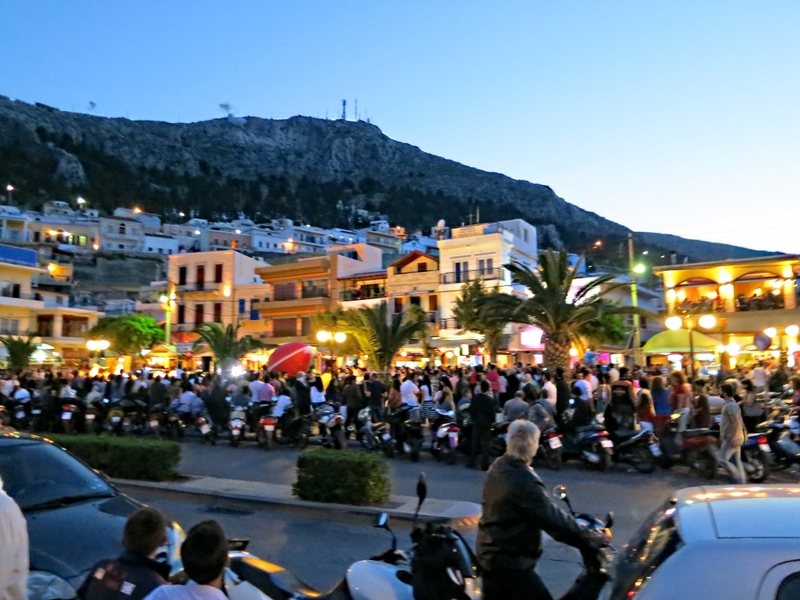 Pothia, the main town and harbour of Kalymnos on Good Friday, ‘Big Friday’ or ‘Clean Friday’ as it is known in Greek gave a faint inkling of what it must be like in a besieged city like Sarajevo during the Balkan conflict or Damascus today. Not that there was any killing but there were explosions just about every minute of the day. They varied between the sniper-like ‘crack’ of fire-crackers, ‘bangers’ as we knew them as kids, and the occasional deep thump of dynamite which reverberated through the body. Small children threw bangers from their doorstep and covered their ears as the explosion echoed and amplified in the narrow streets. Now and again a really meaty explosion seemed to come from the harbour itself. “They’re just practising for Sunday” said Dimitri. I thought to myself “if there are this many explosions on Friday what is the main event going to be like on Sunday”. Nobody turned a hair, just carried on chatting normally, the noise hardly seeming to register. 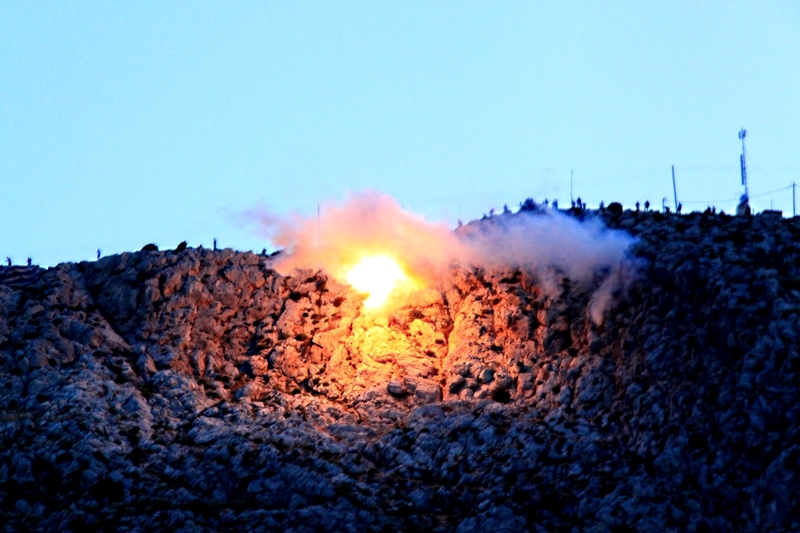 Apparently there are fireworks in most places in Greece at midnight before Easter Sunday to celebrate the Resurrection of Christ after the sombre crucifixion of ‘Clean Friday’ but in Kalymnos they traditionally take the celebration to a whole different level with large-scale throwing of dynamite from the craggy mountain overlooking the town to the south. 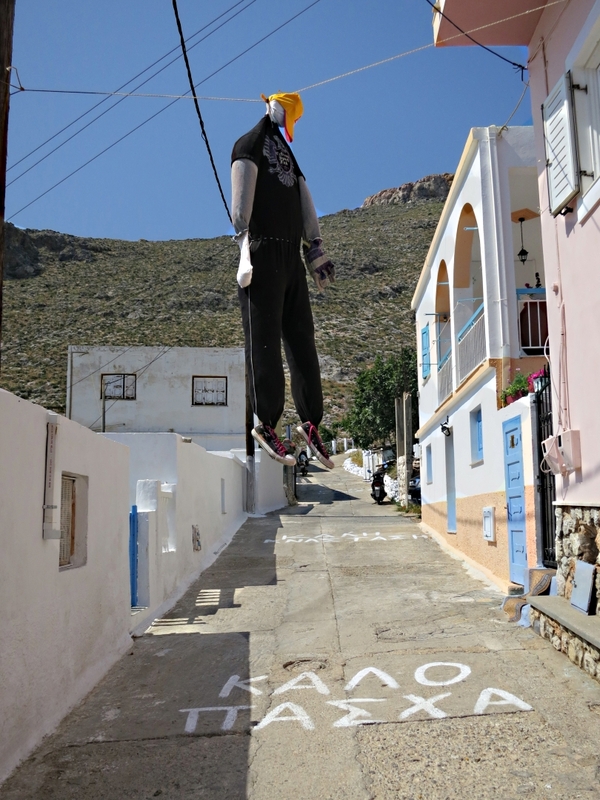 As I walked through the narrow streets and alleys up to the shoulder of the mountain to the north of the town time and again I came across “ΚΑΛΟ ΠΑΣΧΑ” (Good Easter) and “ΚΑΛΗ ΑΝΑΣΤΑΣΗ” (Good Resurrection) painted in large letters across the road. In a couple of places there were crudely made stuffed dummies hanging from posts or wires across the road. To British eyes they looked like Guy Fawkes effigies but I guess that they were meant to represent Christ on the cross, to be taken down at midnight on Saturday. It was very alien to my own church background but it didn’t cause me any problems. On the contrary it brought home to me as I trudged up the mountain that it was a visualisation of the fact that Christ did hang on the cross, shown by a tradition dating back centuries to when symbolism was a major form of communication for the mass of people who couldn’t read or write in the same way that frescoes in many of the old churches are. What is important is to go beyond the symbolism to the reality of what is being portrayed. 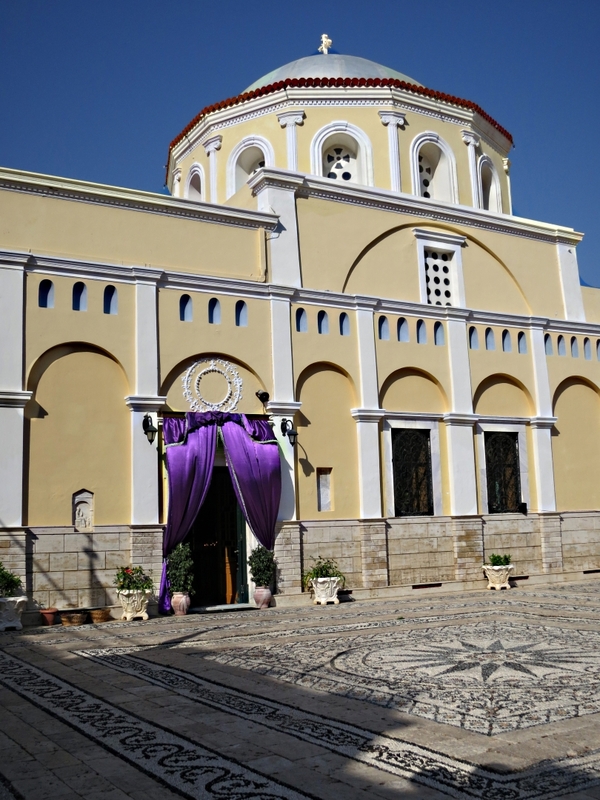 Traditionally Easter is a much bigger festival than Christmas in Greece. Theologically this makes sense in that the crucifixion and resurrection are more important than the birth of Christ. 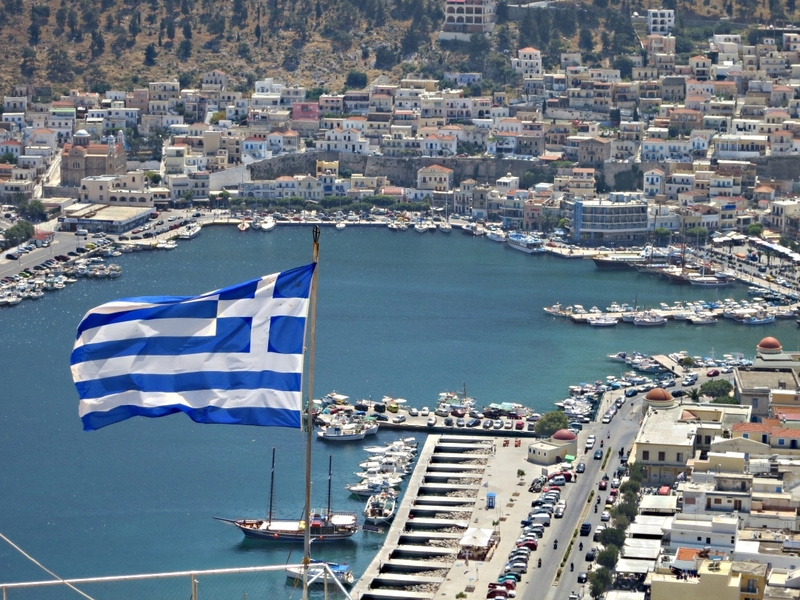 Certainly Clean Friday, was big in Pothia on Kalymnos. When I got back to town from the mountain the bars and restaurants along the harbour front had gradually filled to capacity as families came from church, dressed in their best for the occasion, and sat to eat at long tables, friends chatted over a frappé or a beer. The roadside was packed with parked cars, motorbikes and scooters. There was a distinct buzz between the bangs. Saturday was considerably quieter than Friday but that was because I was in Emborios rather than in Pothia. Had I been in Pothia it would have been considerably noisier. I know this because as I sat tapping away at the keyboard on my balcony I could hear the explosions rumbling like thunder in the distance at a few second intervals for nearly an hour from noon onwards. He showed me some footage filmed among those throwing the dynamite. It was very impressive, more so than what is on YouTube. In Emborios there were periodic small bangs but “they are just firecrackers thrown by children” said Dimitri somewhat disparagingly. 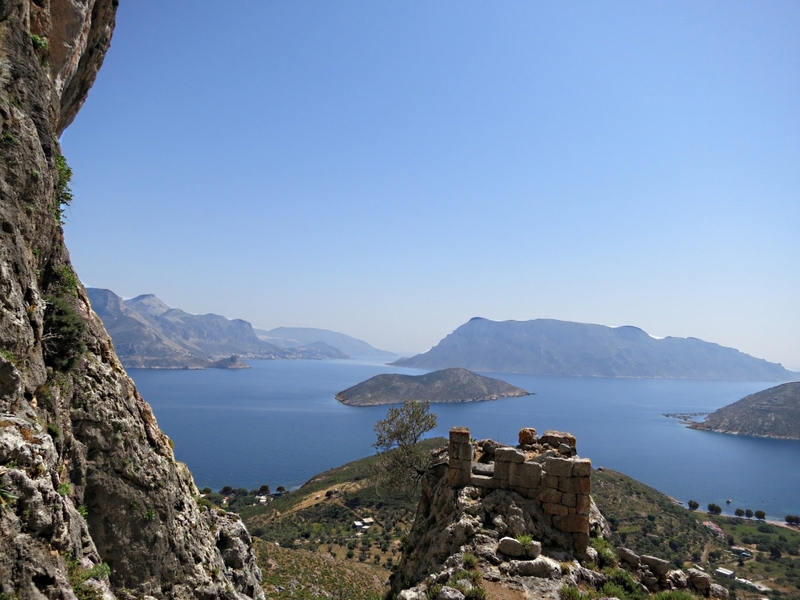 I walked up to the Kastri high in the crags and the crack of explosions echoed around the small rocky amphitheatre. Towards midnight it’s time for church service to welcome the Resurrection and then the return back to homes carrying a lighted candle, the Holy Light, lit from a candle jn the church in turn lit from a candle flown by jet to Athens from Jerusalem where it is lit ‘miraculously’ in Jesus’ Tomb. Back in the house it is used to light another, bigger candle. There then follows the traditional cracking of red-painted Easter eggs one on the other. There are few of the chocolate variety in evidence in the shops unlike the UK. The holder of the egg which remains uncracked is said to have good luck for the year. My egg was cracked at both ends fairly early on so I’m spared from expecting anything. The eggs, hard boiled of course, are then eaten as the precursor to a meal of soup made from the entrails including the lungs and stomach-lining (tripe) removed before the goat is put in a traditional clay oven to cook slowly for 12 hours or so, the traditional ‘Mouri’. The soup is to break the Lenten fast and prepare the stomach for the feasting to follow on Sunday. Before the gathering breaks up at close to 2 in the morning I am advised that “from tomorrow morning and for the next 40 days we don’t say “κάλη μέρα’ (good day) when we greet each other. Instead we say Χριστός ανέστη! (Christ is risen) and the response is Αλήθεια ο Κύριος (Truly He is Lord). I don’t know how much of this reflects personal faith in Christ but at least the traditions remain and are wholesome. Sunday begins quietly and slowly after the night before. In the kitchen preparations go on for the feast. The goat is brought from the oven and sampled, then cut up and mixed with herbs and rice. The previously removed heart, lungs and kidneys are wrapped in intestinal membrane and sinew into small parcels, dressed with oregano, threaded onto a spit and roasted slowly. There are dolmades with vine leaves from the garden, stuffed mushrooms, and a large Greek salad. Around the middle of the day the family gather for the meal at a long, shady table in the garden I’m welcomed, privileged to join them. It’s not rushed, it’s enjoyed, savoured. In the evening I get on the back of Dimitri’s motorbike and we go to Pothia for the Big Bang. We plan to watch from the main square on the harbourside and it’s already packed, only able to park the bike in the narrow side streets leading from the harbour. He explains the techniques and the ethos. How it’s imperative to be precise and calm particularly when lighting the fuses in strong wind like tonight. How the satisfaction, the thrill, is watching the device leave your hand and arc through the air. How no one except the throwers are allowed on the mountain. It’s carnival time in Pothia. Vendors with strings of helium filled balloons wander through the crowd. All the tables in the many seafront bars, tavernas and restaurants are full. We stand with hundreds of others watching device after device explode, feeling most of them compress the cavities in our bodies. 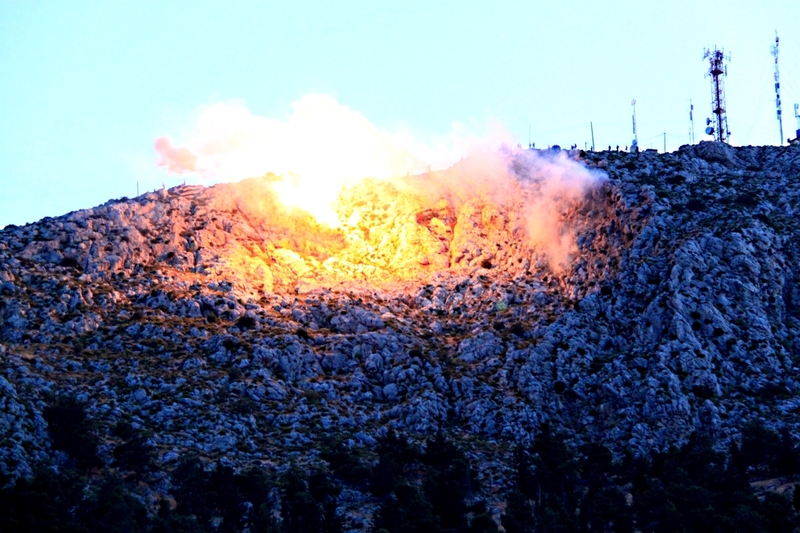 Some are single explosions, others are coordinated to go off in rapid sequence. 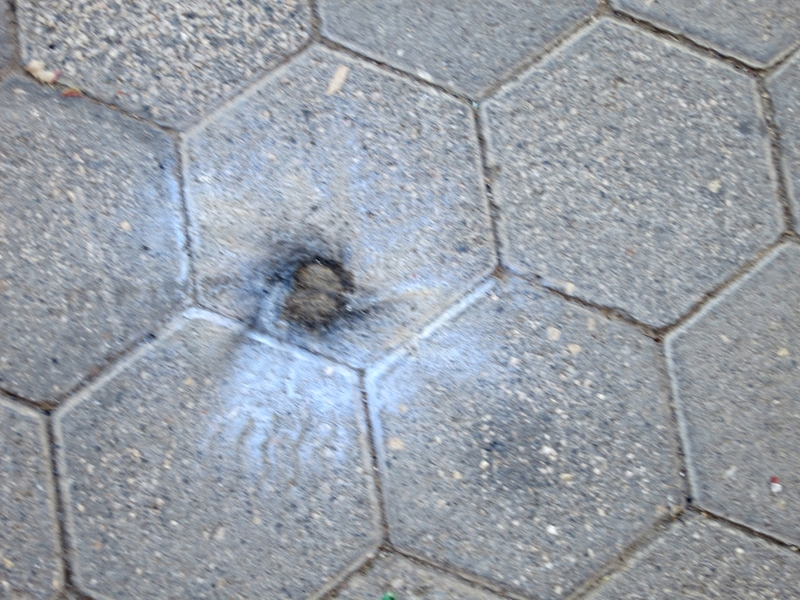 Depending on the explosive used the smoke is either white or brown. The flash becomes more vivid as darkness descends, each lasting microseconds, most effective in coordinated sequence. I set the SLR to servo drive and at 3 frames per second shoot over 250 frames in short bursts, capturing just a handful of flashes. I have been to many pyrotechnic displays in European countries but have seen nothing this. 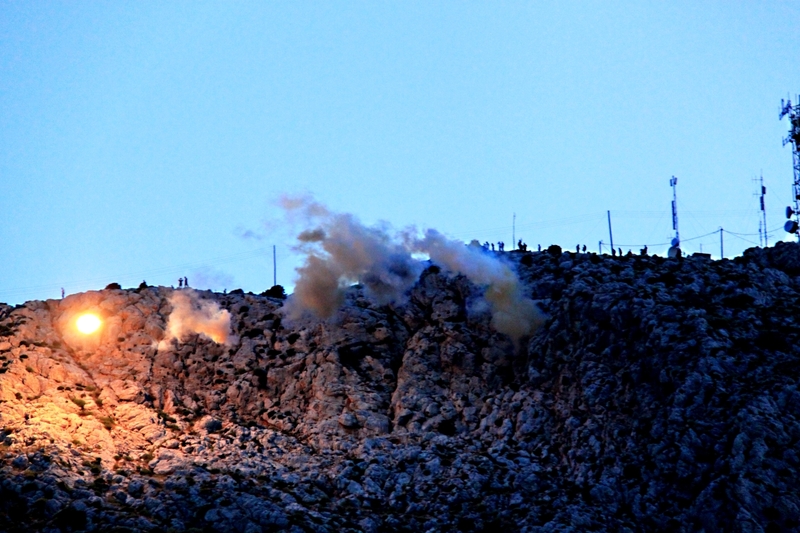 Easter on Kalymnos certainly goes with a bang … or 2000. 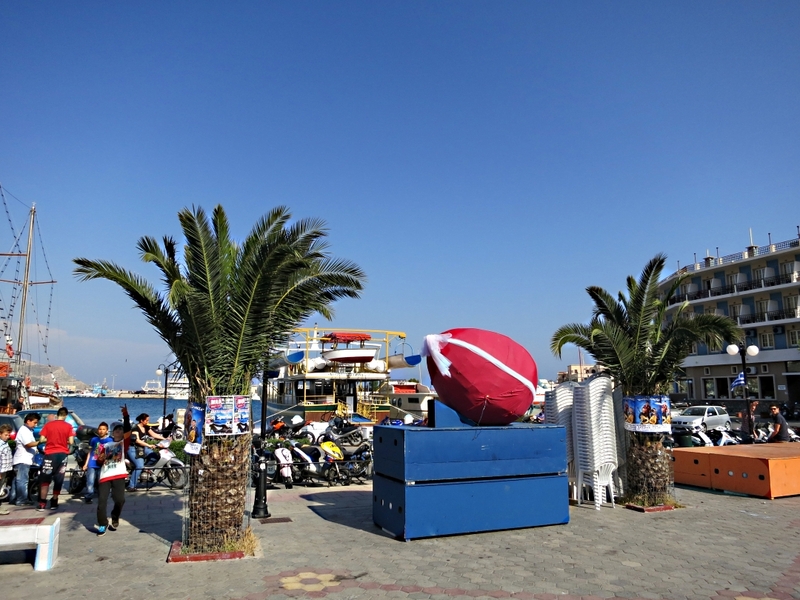 This entry was posted in Greece and tagged carnival, Clean Friday, dynamite, Easter, explosions, Good Friday, Greece, Καλό Πάσχα, Kalymnos, Kastri, Pothia, pyrotechnics, Resurrection. Bookmark the permalink. Thak you for this Barry. Quite fascinating.